Right around Christmas I visited a friend who had a beautiful chalkboard that she made all by herself using some lovely chalkboard paints and excess molding and all that great stuff. And I was all ready to make one for myself. Except that I didn't want to be a crazy-crafty and all. Instead I found some LOVELY Peel & Stick Chalkboard Panels from Wallies . And they are WONDERFUL!! There are 4 in a pack and each piece is 9" x 12". 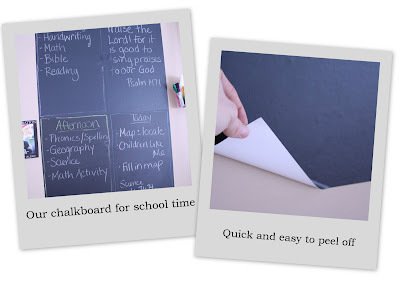 You can put all four together in any direction/shape you want and make your own chalkboard. I bought two packs so that I had a total of 8 panels to work with. The best part is they are removable, reusable and will stick practically anywhere. On the fronts of cabinets, walls, etc... They don't leave any residue on the walls and if you get tired of them, you can move them somewhere else without having to repaint or patch holes. I am loving them. There is no residue left over on the squares from the chalk when you clean them. I've just been using a dry paper towel and wiping them clean with that - haven't even used water yet. If you don't feel like drilling, painting or going through a lot of work, these might be handy for you to have in your house too - check the Wallies out! Thanks for the tip! I just ordered it for our schooling area too! I have a large one in our kitchen that I teach from but these will be great for them to sit and use on lap trays or on cabinets where they can reach easily.